Larson died in 2014, and McCain wrote in his recent memoir that he wanted to be buried next to his friend, "near where it began". But the real lesson is this: The politics of McCain and Co. failed in the eyes of tens of millions of Americans. The website reported that police responded to a 911 call to Miller's home around noon Friday, where they found a deceased male. Charges were filed against the rapper last month after he was arrested in May for driving under the influence and hit and run. 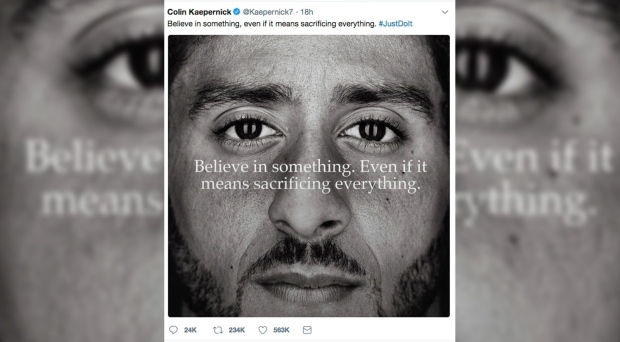 This comes after the release of Nike's newest "Just Do it" campaign, featuring Colin Kaepernick, who spearheaded a protest movement against social injustice by kneeling during the national anthem. I would love to see how they would protest Home Depot: 'The walls in my house must go!' And also, I'm not going to lie, those flaming Nikes makes me nearly want to pay more. Nike's decision to use controversial National Football League star Colin Kaepernick in its latest ad campaign has caused a worldwide backlash but it has received the backing two of the biggest sports stars who also feature in the commercial in LeBron James and Serena Williams. "Even if it means sacrificing everything" written across the photo. "I stand for anybody that believes in change". "Cutting swooshes out of your socks is a powerful statement that says I have too many pairs of socks", Kimmel said on Tuesday night's episode of Jimmy Kimmel Live! "I am not going to stand up to show pride in a flag for a country that oppresses black people and people of colour", Kaepernick said. "Ask if they're insane enough", James replied with the sportswear giants' motto: "#JustDoIt". "Ask if they're insane enough". On Twitter, #BoycottNike has been trending with videos former fans burning their Nike shoes in protest. Kaepernick started the protests in 2016. One of the biggest stories over the last week, at least in the sports word, has been Nike's endorsement of former NFL Quarterback Colin Kaepernick. Dozens of other players began joining Kaepernick, and he has become a symbol of the dividing lines over race in America.